In Diablo III, "Armor" has two meanings. It's a common term used to refer to any sort of equipment other than a weapon or shield. It's a specific statistic that means what "defense" does in most ARPGs. Higher Armor means that characters take less damage from all attacks, through the damage mitigation effect. The armor stat works much like a resistance in Diablo 3. Higher Armor means that more of the damage from attacks is absorbed or mitigated. This is not how armor (defense) worked in Diablo 2; in that game higher armor worked against monster to/hit and made it less likely that they would strike your character with an attack. This design choice forced the developers to make monsters hit for very high damage since they so seldom connected, which lead to a boom or bust sort of combat. Diablo 3 uses the resistance-like form of Armor to create a steady flow of damage that players can learn to mitigate with more Armor, higher hit points, blocking, life regeneration, life on hit/life leech, or other options. 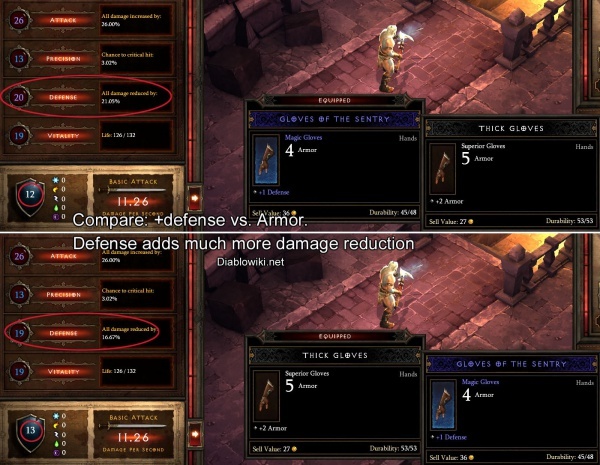 Armor tooltip shows damage reduction. Every piece of armor (equipment) has an Armor value in Diablo III. These add up with Strength and may be modified by various skills and passives to arrive at a total Armor value which grants a substantial damage reduction. This figure is a key source of damage mitigation in Diablo 3 and has a major effect on a character's survival ability. As with resistances (which function very similarly) there are diminishing returns on the benefit from higher amounts of Armor. The first thousand points of Armor effect a damage reduction of about 25%, while moving from 4500 to 5500 only yields about 4.5% damage reduction. That 4.5% might be of huge importance to a high level character taking on a dozen enemies at once, but it's clearly a lot less of a total change than the first couple of thousand points of Armor provide. The formula for calculating damage reduction against equal level enemies is: 100 * armor / ( armor + 50 * character level ). In terms of effective HP for a lvl 60 character, every 3000 armor you have increase your EHP by 100%. For lvl 70 characters, 3500 armor does the same. The Strength attribute adds directly to the Armor total, in simple arithmetic fashion. More strength = higher Armor = more damage reduction. This is very handy for Barbarians and makes them take much less damage from melee combat. Other characters get less benefit from it; the screenshot below shows a Paragon 49 Monk who has virtually no Strength on her equipment and thus gains very little additional armor that way. The items (armor) worn by characters in Diablo 3 are hugely-varied and individually-designed. All pieces of equipment look different on all classes, and often vary between the genders of each class as well. This required a huge amount of artwork and animation, but is part of the fine polish Blizzard puts on all the components of their video games. Various pieces of armor, by a master blacksmith. 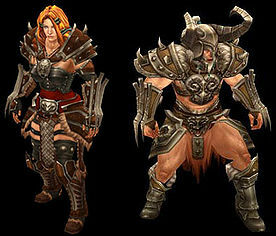 There are more types of armor to be worn in Diablo III. All the item slots return from Diablo II, plus several new ones; shoulders, pants, and bracers. Shoulders -- New in Diablo III. 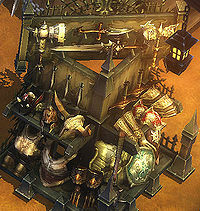 Bracers -- New in in Diablo III. Pants -- New in Diablo III. Belts -- These do not hold potions as in Diablo II. They're purely another piece of armor. While the developers initially planned not to include class-specific armor types, that changed during game design. By the beta test there were numerous pieces of armor that could only be equipped by one class. Weapons are much the same, with a few types that are class-specific, and others that can only be used by some, but more than one, class. 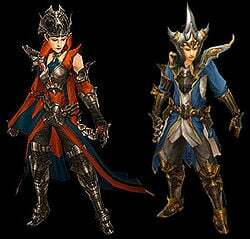 The same piece of Armor in Diablo III looks very different depending on which class is wearing it, and often by the gender as well. This system expands on the basic component looks in Diablo 2, with radically more variety and design depth. Another major change to Armor in Diablo 3 is the removal of repeating armor types on each difficulty level. Gone are Diablo 2's Exceptional and Elite armor/weapon classes, each of which repeated all the same item graphics, but with bigger stats. 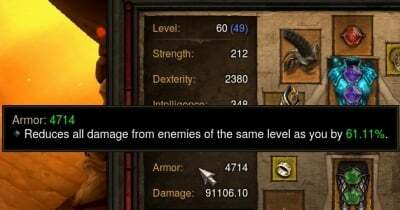 This means that every piece of armor and weapon in Diablo 3 is unique (by level and appearance) but also means there are fewer total items, since everything doesn't repeat 2 or 3 times. Gear sets are the term the D3 Team uses for the 18 different armor sets. See the gear sets article for full details. A few sample sets, revealed by Blizzard prior to Blizzcon 2010, can be seen below. 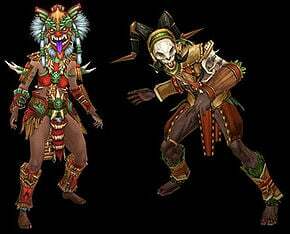 Two Witch Doctor gear sets. The following was applicable during development, when the attributes were (briefly) changed from Vit/Str/Dex/Int. The information does not apply to the final game, and is preserved here purely for curiosity/posterity. Armor is a value on all types of armor items. More armor = more damage reduction, but a lot of Armor is required to see significant improvements. Defense is one of the four core character attributes/stats. It grows as your character levels up, and can be added as a bonus from items, gems, skills, and more. Armor vs. Defense compared with item bonuses. Shot from the Diablo III beta. This page was last edited on 11 July 2018, at 01:45.